The extra Van Allen belt, which lasted only a month, may have been caused by a solar shock wave. A third radiation belt, found unexpectedly between the usual two, was discovered by the orbiting Van Allen Probes. 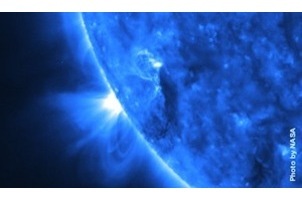 Astronomers believe it was likely the result of a solar shock wave. Earth’s magnetic field normally gathers energetic particles from the sun into two doughnut-shaped regions circling our planet. Called the Van Allen Belts, the inner one ranges from about 400 to 4,000 miles above Earth’s surface, and the outer one from 6,250 to as far as 40,000 miles. But in February 2013, NASA announced it had, briefly, observed a third belt. On Aug. 30, 2012, NASA launched the twin Van Allen Probes (formerly known as the Radiation Belt Storm Probes) to study the belts. Between Sept. 3 and 6, the probes’ instruments detected particles making up a third belt forming between the known two, only to disappear in early October. Scientists think a shock wave (an energetic disturbance) from the sun disrupted the outer belt, moving particles lower and forming the temporary belt. Another shock wave a month later likely destroyed it. The Van Allen Belts can be harmful to the numerous satellites that routinely encounter them, so it’s in industry’s best interests — as well as science’s — to better understand their behavior.